Elke Eckerstorfer was born in Linz, Austria. After a musical education at the Bruckner-conservatory in Linz she continued her studies at the University of Music and Performing Arts, Vienna. She attended the piano-classes of Antoinette van Zabner, the organ-classes of Rudolf Scholz and Michael Radulescu and the harpsichord-classes of Wolfgang Glüxam and Augusta Campagne. 2000/01 she spent one year in Paris to study french music at the Conservatoire National Superieur with Michel Bouvard and Olivier Latry. 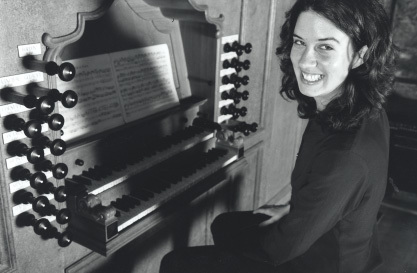 She won prices in several national and international organ competitions. As well as doing recordings of both organ and piano music her working focus is now on playing organ concerts as a soloist or with ensembles. Furthermore, she has also been active playing harpsichord in various orchestral and chamber music projects and is currently a member of the old music ensemble "Fioretto". In the course of her career she has been gathering international experience by playing concerts in many countries in Europe such as Germany, Switzerland, Spain and France. Elke Eckerstorfer also teaches music at the University of Music in Vienna.